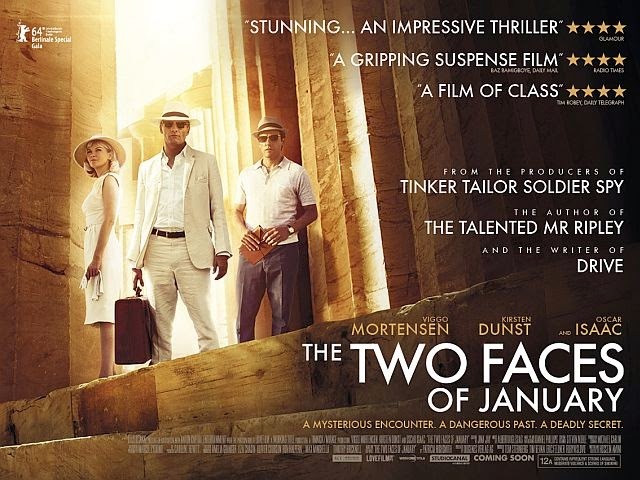 Based on a lesser known novel of pyscho-sexual thriller writer Patricia Highsmith, THE TWO FACES OF JANUARY is a satisfying psychological study, though sometimes dull. Essentially a two-hander, the story picks up in 1960s Athens, with the dashing Chester (Viggo Mortensen) and his younger wife Colette (Kirsten Dunst) hiring the shifty ex-pat Yank Rydel (Oscar Isaac) as a tour guide. The couple are evidently in love, though she is attracted to the openly admiring younger man. Accordingly, when Rydal stumbles upon Chester covering up the murder of a detective sent to recover the money he swindled, Rydal offers his services as getaway guide to Crete while they wait for their new passports. Is it the money that attracts him? It's certainly a step up from skimming cash from naive young tourists (Daisy Bevan looking spookily like an echo of her mother Joely Richardson). Or does he genuinely care for the ditzy Colette? Or, this being Patricia Highsmith, is something altogether more murky, half-glimpsed and fascinating at play? For Rydal has, what we can only put bluntly, "daddy issues", and it is patrician swindler Chester with whom he is ultimately infatuated in a kind of Oedipal obsession wherein he has to refashion his failed family life through a love-hate relationship with her father-nemesis. It is when exploring this deeper similarity - the two faces of failure, covetousness and fallibility - that the movie really becomes something memorable and insightful - and where we see Viggo Mortensen give one of his finest performances. Sadly however, after the glamour of the first act of the movie, it lulls into tediousness punctuated by occasional violence in its second act on Crete, making it hard work to stay put until the magnificent final act. Overall, then, a handsome looking film with a superb denoument - well-cast, beautifully clothed, and filmed on location in Athens, Crete and Istanbul. First time feature director but well-known screenwriter Hossein Amini deftly handles - and arguably improves - the source material, but somehow never quite overcomes the lack of pace in the Crete scenes. THE TWO FACES OF JANUARY has a running time of 96 minutes and is rated 12A in the UK for infrequent strong language, moderate violence & scenes of smoking The movie played Berlin 2014 and will be released in the UK, Ireland and Turkey on May 16th; in Germany on May 29th; in New Zealand on June 12th; in Spain on June 13th; in the USA on June 17th; in France on June 18th; in Greece on June 19th; in the Netherlands on June 26th; in Belgium on June 30th; in Lithuania on August 1st and in the USA on October 3rd.